Cincinnati, OH (April 14, 2018) – mimicEducationalRobots (a division of Robomotive Laboratories LLC) is changing the way coding is taught with mimicArm. The Cincinnati-based small family business launched a new Kickstarter campaign (https://www.kickstarter.com/projects/713401305/662798422?ref=455790&token=e4d4249c) on April 24th to help advance the development and production of the new technology. 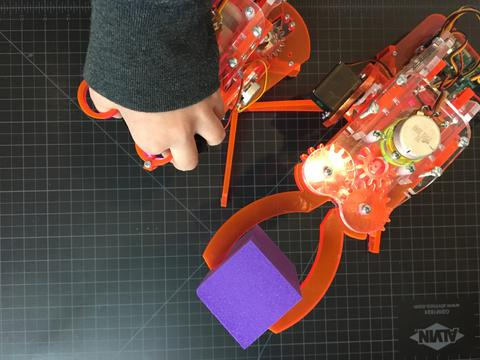 mimicArm is a desktop sized robot arm that represents a new approach to teaching programming. mimicArm is a collaborative robot, or “cobot”, designed to interact with human users. 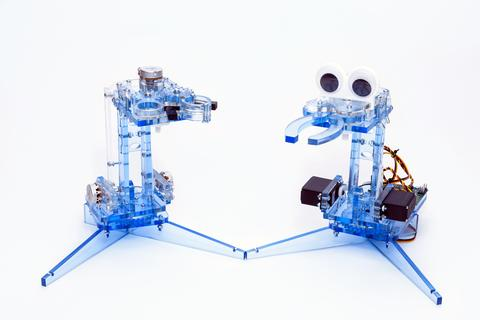 Unlike other educational robots mimicArm teaches children to program robots to work in tandem with humans. Using the mimicArm controller children as young as 5 are immediately able to interact with mimicArm. When they’re ready, users can begin coding using mimicBlock, a graphical coding interface. mimicArm is also programmable using actual C code and includes simple pre-written functions to allow the quick creation of complicated programs. The provided programming experiments start simple, but build to complex interactive artificial intelligence programs. Paired with the inputBox and other sensors the user can create a truly interactive artificial intelligence robot arm. The key to bringing mimicArm to life is the mimic arm controller with patent-pending Posi-Feeltm grip controllers. The user grips a simple scissor control and moves his or her arm and hand in natural ways. mimicArm will “mimic” these motions. A series of joints, pivots and sensors are built into the mimicArm Controller to make this possible. When the user is ready, easy to use programming software and robust examples walk them through the process of learning to program their own robot. This assemblage of new technologies allows the user to see immediate frustration-free results without the risk of outgrowing the robot in a short time. The infinite expandability and endless programming possibilities will keep even expert programmers captivated. mimicEducationalRobots realized early that a single package would not fit all users needs, so backers have a choice of three packages, each with a unique user in mind. The mimicArm kit version includes the robot and manual controller. This version is great for those who want to ease into robotics coding, or those that already have sensors that they’re ready to integrate with the robot. Perfect for beginners and experts, this package is the most affordable option. The mimicArm Super Fun Kit is centered around manual mode, with a set of accessories to maximize the fun factor. Users can stack the stacking blocks (included), or program the robot to do it for them. The Great Big Button is also included, and offers additional capabilities for those honing their coding skills (or for those with younger siblings that really want to touch something). “mimicArm Super Fun Kit is targeted towards younger users, but is also a great way for beginners to make coding interesting as well,” says Pipitone. The mimicArm Deluxe Kit is the most complete kit offered. Including everything from the mimicArm Super Fun Kit, the mimicArm Deluxe Kit adds the input box and IR Distance Sensor for maximum interactive possibilities. The inputBox incorporates buttons, a microphone and other sensors, and a microSD card. “Programmable with both mimicBlock and Arduino, the Deluxe kit really expands the possibilities. 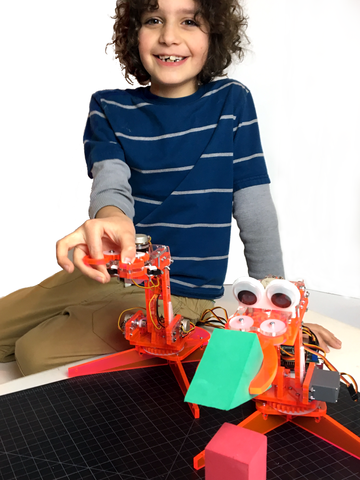 With this kit the user can truly program their own interactive robot,” says Pipitone. 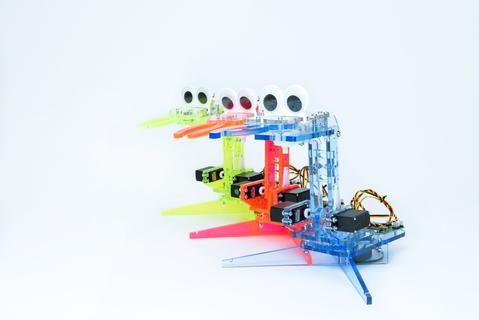 For more information, please visit: http://www.mimicrobots.com/. Dieser Eintrag wurde veröffentlicht in Crowdfunding, Development, Education & Studies, English, General, Hardware und verschlagwortet mit Kickstarter, mimic, mimicArm, mimicBlock, Programming, Robot-Arm, Scratch, Teach-In von Sebastian Trella. Permanenter Link zum Eintrag.